The R-PLEX Rat Adiponectin Antibody Set includes a matched capture and detection antibody pair and calibrator for the quick and easy measurement of Adiponectin in biological samples. R-PLEX products leverage MSD’s electrochemiluminescence technology for better sensitivity and a larger dynamic range than traditional ELISAs. R-PLEX matched antibody sets enable the development of singleplex and multiplex immunoassays. Individual assays may be developed using MSD avidin- or streptavidin-coated plates. Custom multiplex assays with any combination of R-PLEX analytes, as well as R-PLEX plus U-PLEX analytes can be developed on U-PLEX MULTI-SPOT plates. To learn more about the advantages of R-PLEX products click here. 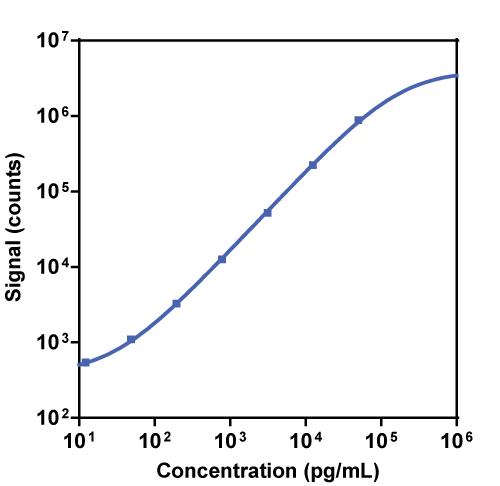 Calibration curve for the R-PLEX Rat Adiponectin Antibody Set was assessed and representative data are presented below. Description - Adiponectin (ACDC, ADPN, APM1, APM-1, GBP28, ACRP30, ADIPQTL1, ADIPOQ) is secreted exclusively by adipocytes and is thought to play a role in lipid and glucose metabolism. Adiponectin enhances insulin action by activating glucose uptake and fatty acid oxidation. In addition, this adipokine has potent anti-inflammatory and anti-atherosclerotic properties. In contrast to most adipokines, plasma adiponectin is inversely correlated with body mass index (BMI) in humans and rodents.